Mark has been working “in and around” butchers since he was 13. As soon he could leave school he began his apprenticeship with a local business and that’s where the love affair began. Marks first award was the much coveted YTS Young Butcher of the Year Award (a two year course which he completed in one!) Whilst working his way through butchering qualifications he also learnt the highly skilled trade of a slaughterman and spent time working in reverred Michelin starred establishments alongside Craig Bancroft and Nigel Haworth. But it wasn’t until he discovered a farm shop in Wigglesworth that he found his second love…pie making. It was in the North Yorkshire farm shop at Hammerton Hall that Mark utlised the bakery and developed and perfected many of the award winning pies he still makes today. In 1999 Marks talent was recognised by a local businessman and he was brought in to turn around the fortunes of Dales which was ailing at the time. 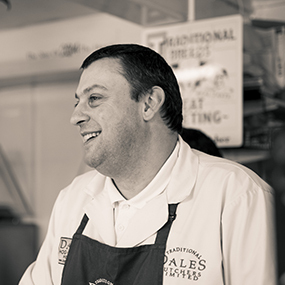 Since then the butchers has gone from strength to strength and Mark not only collects numerous pie and sausage awards year in year out but has now extended the business nationwide with his on line service. He’s built up a seasoned, experienced team and has expanded into BBQs, Hog Roasts, Events and Weddings, not to mention supplying numerous quality restaurants and bars within the Northwest.